All moms and dad should understand the main rule: if their kid wants to help you with cleaning, let him do it. Very often when you have kids, your house looks like a toy store where toys are in every corner. When this is the picture of your house it’s high time for your kids to help you clean their toys and rooms at any age, even the sooner the better. No one expects from them complete cleanness, but at least they can try. Involve them in the process of cleaning of their rooms. Make the cleaning process a game for them. If you have toddlers and you think that he or she is too young to clean, you are wrong. Toddlers are interested in everything that is new, and may be they will help you to clean with the better enthusiasm than older kids. It doesn’t mean that you need to give a toddler a mop, but if he wants to help you with cleaning dust, give him a cloth, let him do it. Older kids, 5-year-olds, for example, can handle more serious tasks and they do not need much of your supervision. 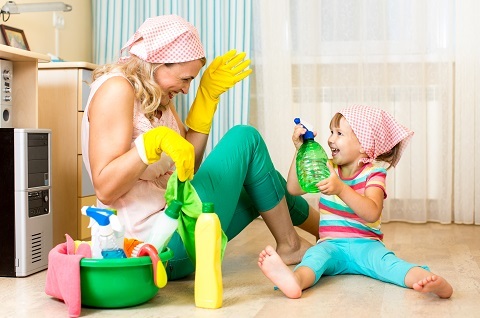 Six-year-olds and seven-year-olds can help you with sweeping, with laundry, with washing the dishes, etc. Hopefully at any age they will have the attitude like a toddler has. We wish you to raise the kids that will be helpful and not lazy.